Law firms need to be run like a real business is the main message expertly conveyed by Canadian lawyer Mitchell Kowlaski in Avoiding Extinction: Reimagining Legal Services for the 21st Century. The book is written as a story about fictional law firm Bowen, Fong and Chandri, PC. It follows General Counsel of Kowtor Industries considering outsourcing legal services to the firm, the induction of a new recruit, solicitor Mark Reynolds, to the firm and tells us about the make up and role of the external Board of Directors. The style of the book reminded me of business development books such as The Go-Giver, Millionaire Upgrade and The monk who sold his Ferrari (to name but three). To see a business development book written in this style by a lawyer for lawyers is refreshing. The ideas conveyed in it are not necessarily revolutionary (I had been reading about them and implementing some of them at my own law firm, Inksters, before now) but will be to many and are now condensed into a readily digestible and entertaining format. Unless you have been hiding in splendid isolation or burying your head in the sand (many lawyers do) over the past few years you could not avoid being at least vaguely aware of legal services outsourcing (in the book carried out in India and the Philippines), cloud computing (which my law firm adopted over a year ago) and value pricing. These were perhaps the main three advantages over competitors seized by Bowen, Fong and Chandri. The book also hints at the possibility of Alternative Business Structures in North America (something that we are all too aware of, or should be, in the UK). Mitch considers that the traditional law firm partnership model is doomed to failure. This is due to “the collective action dilemma”. This is where you have a group of people all acting in a perfectly rational way for their own interests in the short term. This is all too clear to see in many law firms and the difficulties that many have found themselves in during recent recessionary times. The solution that appears to be adopted by many such firms, when in difficulty, is to merge with a law firm more financially stable but who operate in exactly the same way as they did rather than reconstituting themselves in the style of Bowen, Fong and Chandri. Mitch thinks that value pricing is the way forward. Most law firms in the UK do have fixed prices for various services (e.g. domestic conveyancing) but there is still an adhesion to time and line charging in many spheres such as litigation and executry (probate) work. I do, however, wonder whether a complete move to value pricing should not retain an element of time recording from a management perspective. Might it not be a good idea to monitor the time spent on a job to see if you can maintain the time involved within the value you priced it at? Time recording should not necessarily be all about the billable hour but also ensuring time is spent on important non-chargeable activities such as marketing and professional development. Mitch, however, reckons that a complete freedom of tracking time creates a cultural shift for the common good of the firm. Bowen, Fong and Chandri do not hire student or junior lawyers. They see this as a costly and unproductive exercise for law firms to undertake. They “do not hire reams of lawyers to see which ones sink or swim. That is a stupidly inefficient and ineffective way to do things and yet firms continue, like lemmings, to follow the same practice year after year. No other business runs that way”. There could be some truth in this. However, if every law firm adopted this policy there could come a time when there are no trained lawyers with experience to employ! I also believe that law firms can gainfully employ law students whilst they are still at University, glean their ability to swim at an early stage and, if appropriate, provide them with a traineeship. That trainee could become a great asset to the firm as an assistant solicitor further down the line in a way that a lateral hire (not accustomed to the forward thinking ways of their new firm) may never be. The new recruit at Bowen, Fong and Chandri gets virtual training using a computer simulated game in which he is an Avatar. However, no mention of Bowen, Fong and Chandri using social media or the internet to market themselves and gain new business. Perhaps it was taken as read that a firm like this would already have that well covered. Alternatively, perhaps Mitch does not see such activities as being fundamental to avoiding extinction as a legal practice. Many social media Gurus see it as a paramount consideration in our ‘always on’ age. However, all in all, Mitch gives lawyers plenty of food for thought. Even small firms (and that includes sole practitioners) can take a lot from this book which tells the story of a big law firm. Whilst you might not be about to open your own outsourcing centre in India or the Philippines there are perhaps areas of your work or administration that could usefully be outsourced to third party providers. I commend the book to any lawyers serious about their future. But don’t just read it, act on it. In his preface Mitch refers to Richard Susskind’s book The End of Lawyers? being “politely received by many lawyers in Canada, then promptly put on their bookshelves – unread. The lack of innovation and thoughtfulness in Canadian law firms continued without a step”. I rather fear that the same fate may unfortunately await Mitch’s book. Or is the timing of this book more apposite? 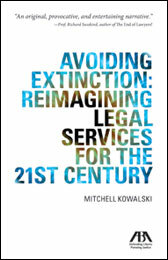 Avoiding Extinction: Reimagining Legal Services for the 21st Century by Mitchell Kowalski (ISBN: 978-1-61438-298-0) is published by and available from the American Bar Association. It is also available in the UK from Amazon.